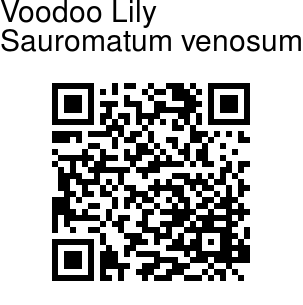 Voodoo Lily is a very unusual, shade loving plant, found in the Himamalyas. It produces a tubular shaped, purplish green flower, with dark purple markings on the inside, which surrounds a blackish purple central spike, making the spike look like it has been provided its own vase. 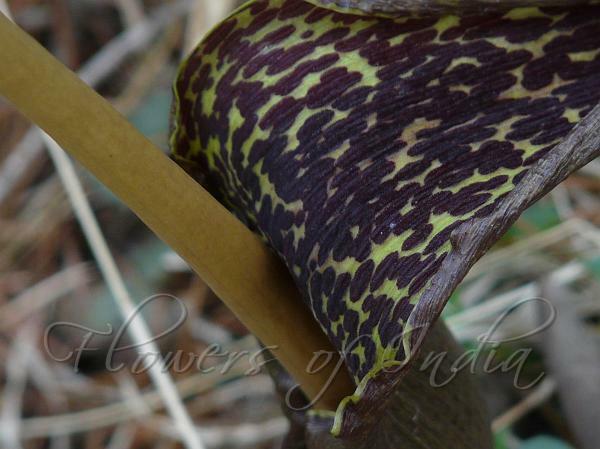 When the large finger-like flower, 2-3 ft, blooms, its emits a foul smell, inspiring names like corpseflower. The real botanical flowers tiny, covered by the spathe (flap like object). The flowers are followed by lovely green leaves 2 ft purple mottled and speckled stems, providing an umbrella for its roots. Voodoo lily put up its show in early summer and grows 2-3 ft tall. Tubers are 24+ cm. Photographed at Naldehra, Himachal Pradesh.